Kelcy Blanchong of Wauseon with a bump Thursday versus Defiance in a Division II district final at Bluffton University. The Indians won in four sets to win the district title. 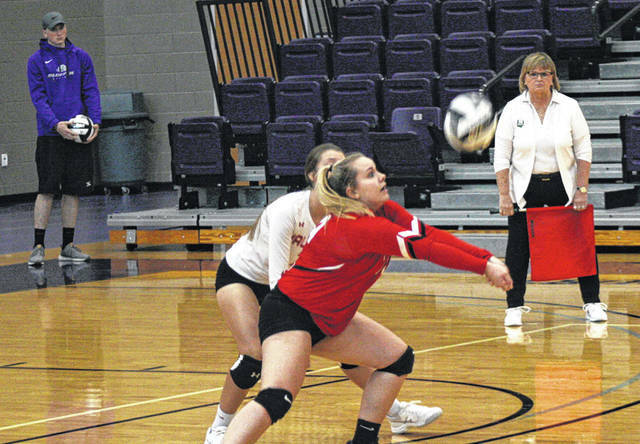 Harlee Floss digs one for Wauseon Thursday in the district final. The Indians next play this Thursday versus Willard in a regional semifinal at Lexington High School. Wauseon’s Maddie Trejo sets one up during Thursday’s match. 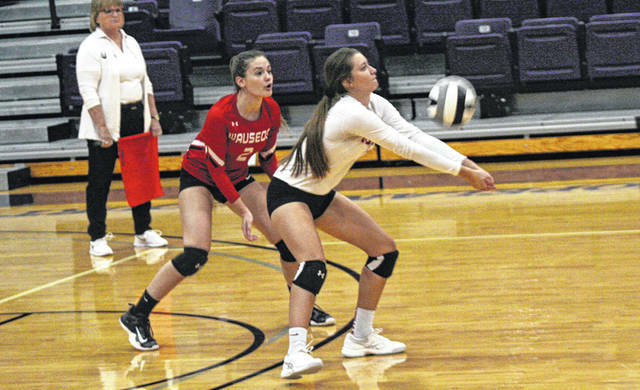 BLUFFTON – Wauseon volleyball will head back to the regional tournament for the first time in 29 years after a 17-25, 25-13, 25-19, 25-15 win over Defiance in a Division II district final Thursday at Bluffton University. It is just the fourth district title in program history. Wauseon went to the regional three straight years from 1987-89, bowing out in the semifinal each time. However, it was the Bulldogs who took charge in game one. They regained the lead, 13-10, on two kills from Kaylee Brashear, Graicen Siler’s block and a Jordan Davis ace. The Indians got one back on a Bulldog serving error, but Brashear followed with a shot down the middle, Madeline Peck blocked one, then Janelle Bryant fired a pair from the left side to make it 17-11. Defiance would cruise to an eight-point victory. “We knew coming in that 15 (Bryant) and 10 (Brashear) for Defiance are just phenomenal athletes and phenomenal hitters,” said Blanchong. “We did not execute our gameplan in game one. We really kind of gave them (Defiance) a lot of shots. They really kind of had their way. We also made several mistakes early on in the game. Very early in the game – the first 10 points, or 15 points or so. It soon became clear that the Indians made the necessary adjustments after game one. With the score knotted at seven, Wauseon ripped off 11 straight to help them take the second game. A Chelsie Raabe left-hand shot broke the tie. Kelcy Blanchong recorded an ace, and Sydney Zirkle’s shot from the left side, another Raabe kill, plus seven Defiance errors made it 18-7. The third game was neck and neck until Wauseon scored the last five points for a 25-19 win, giving them a two games to one edge in the match. In game four, Defiance scored first on Bryant’s shot from the left, however, it all went downhill from there. Five Bulldog errors, plus two Kelcy Blanchong aces helped the Indians jump out to a 15-5 lead in the middle of the game. They would increase that margin by two down the stretch to close it out. Regardless of what happens at regionals, this has no doubt been a season to remember for Wauseon. After winning a share of their first league title in 25 years, they will also be adding a district title to the trophy case. “We really have girls that are devoted to the sport of volleyball,” said Blanchong on what sets this team apart. “Lexi, obviously, is the senior leader. She’s going to Bowling Green. She’s just an incredible athlete. But there are, four other girls on the team that pretty much play volleyball year-round. “I never expected this to happen but I’m so glad it did,” said fellow senior captain Maddie Trejo. “I couldn’t have done it with a better team. This is just amazing. Sauber finished with 20 kills, nine blocks and 23 digs. 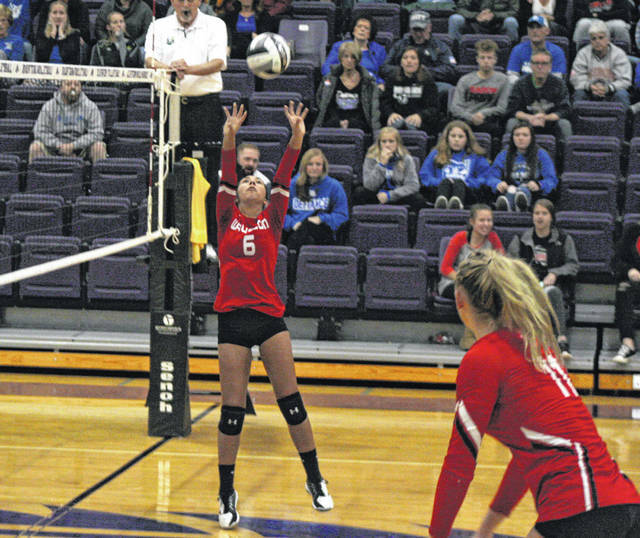 Zirkle missed on just two hits and recorded eight kills and three blocks. Raabe added six kills, four blocks and seven digs. Wauseon, now 20-5 on the season, will be at Lexington High School Thursday to take on Willard in a regional semifinal beginning at 6 p.m.